By 1853 a majority of Joseph Smith’s followers were settled in Utah under the leadership of Brigham Young. Scores of sermons, tracts, commentaries, and books of theology and doctrine written in the middle decades of the nineteenth century chronicle continuing Mormon inquiry into questions about the Jewish people. Both of the contrasting views about Judaism focused by the writings of Joseph Smith and Oliver Cowdery in the church’s early years continued to find issue in the Great Basin. Carvalho was so sick that he was unable to continue with Fremont and was sent to convalesce in Salt Lake City three hundred miles to the north. In his weakened condition, he reports, “I had to be lifted in and out [of the wagon] like a child.”3 Carvalho, who was to stay among the Mormon pioneers in Utah for almost three months, made quite an impression on his hosts. In turn he was struck by what he observed among the isolated pioneer communities of the Saints settling into the mountain valleys of the Rockies. Not all Mormons shared Benson’s enthusiasm for Jewish restoration. Mormons have both produced and inherited a complex and mixed body of doctrines and traditions concerning the Jewish people and the relations between Jew and Christian. Nineteenth-century Mormons were converts from other Christian churches and theologies and practices governing Christian perceptions of Jews and Judaism. Early Mormon leaders were not of one mind about how the restoration affected their theological understanding and practical dealings with other religous traditions. The diversity that still existed in Mormon theology on this topic from the earliest days of the church can be seen by the contrasting views of two priesthood holders preaching near the time of Joseph Smith’s death. At about the same time Smith was assassinated in Carthage, Illinois, church minutes report that an “Elder Whipple” preached to an assembly of the Saints “on the subject of the kingdom being taken away from the Jews and given to the Gentiles and the great work of the last days.”8 In his view at least, the Jews would play little part in the final events. But Whipple’s views contrasted with those of an Elder Norton. In a conference in Greenwood, Steuben County, New York, on the first Sunday of April 1845, a “spirited discourse was delivered by Elder Norton from Isaiah 24:1-6, showing that the covenant made with the Jews, had been broken, also proved from the scriptures, that God had promised to renew it in the last days … [and] that the [p.177] work had already commensed.”9 In Norton’s view the Jews were already assuming their central place on the stage of the last days. Woodruff protested his good will towards the Jewish people: “I do not say this [their ‘rejection’ of Jesus] because I wish to find fault with them. I have a great love [p.179] for them as a people.”18 And he pronounces evil tidings on their gentile persecutors, “Woe unto the Gentiles, who have administered afflictions to the Jews for these many years?”19 Still the cumulative effect of Woodruff’s preaching about the Jewish people was to cast them as justly suffering for venial and mortal crimes, as a cursed pariah community. Orson Pratt was, along with his older sibling, Parley P. Pratt, a charter member of the first quorum of apostles organized in the spring of 1835. Both he and Parley were also prominent theologians and apologists for the church. Orson Pratt’s published works were extremely influential in developing and articulating LDS church doctrine and theology.20 With the exception of Brigham Young, Pratt was the most visible figure in the LDS church for the “gentile” world. Nicknamed the “Gauge of Philosophy,”21 he was a singular intellectual force among frontier Mormons. He was conversant in mathematics, astronomy, surveying, philosophy, and theology, and his sermons were laced liberally with citations from Christian church fathers, Scottish philosophers, Unitarian biblical scholars, and Anglican ecclesiastical theoreticians as well as scriptural prooftexts from the Bible and the Book of Mormon. In this examination of sources, Pratt accepted without hesitation the testimony of early church fathers riddled [p.180] with anti-Jewish invective. Pratt concluded his survey of “ancient manuscripts” by stating that “All, therefore is uncertainty, not only in relation to the Hebrew manuscripts, but also the Greek.”23 In support of this contention, Pratt cites John Chrysostom (347-407 C.E.) and Justin Martyr (ca. 100-ca. 165 C.E.) as authoritative witness to the violence done to biblical manuscripts by Jewish leaders in the second and fourth centuries. It is clear from the whole text of Pratt’s sermon that he did not intend to vilify Jews so much as undermine the exclusive scriptural authority of the Bible. For three decades Mormons had protested that the image of their church, beliefs, and leaders presented by journalists and observers was distorted. But when confronted with the testimony of ancient church fathers, who had no less an axe to grind against Jews than did opponents of the Latter-day Saints against Mormonism, Pratt uncritically depended on their narratives. Pratt’s acceptance of these sources within the context of Judaism is even more striking given his otherwise constant criticism of the writings of a “fallen” Christian church. The lapse in Pratt’s critical faculty is less surprising when considered along side his stated views on Judaism which were outlined in a major address given on 26 [p.181] March 1871. Pratt was working from the text of Isaiah 4:1-5: “Speak ye comfortably to Jerusalem … that her warfare is accomplished, that her iniquity is pardoned.” Pratt took pains to point out this was “a prediction not yet fulfilled.”25 In contrast, Orson Hyde had quoted these verses in order to deny any further corporate guilt of Jewish people for the death of Christ. Hyde insisted that this passage from Isaiah had been fulfilled. There are common threads which stitch all of the preceding comments together and which begin to focus the radical differences which ultimately make of Mormonism an independent Christian tradition. But there are also important differences which amount to two divergent traditions within Mormonism. The differences ultimately have to do with how closely tied various interpreters remain to traditional Christian views. Radically severing such interpretative ties becomes critical then to enabling the crucial differences of Mormonism’s separate tradition to stand forth. Whether it is E. T. Benson’s sermon “which would have done honor to a speaker of the Hebrew persuasion” or Orson Spencer’s open admiration for Israel’s religious culture during the second temple period or John [p.185] Taylor’s harsh assessment of Mosaic legislation or Orson Pratt’s recourse to curses and imputation of guilt, all draw from the source and authority of the Bible as it was read and understood by the Saints. Thus considering how Mormons interpreted the Bible is the first step in understanding disputes which continued within Mormonism during the nineteenth century and which still have issue on the contemporary Mormon stage. We have seen that the early Saints were not naive about the imperfections of Holy Writ, but Mormons in contrast to most orthodox Christians insisted nonetheless on a “literal” interpretation of scripture. What Mormons meant by this advocacy of ‘literal” interpretation and how such interpretative strategies affected their approach to religion and life thus is crucial to an investigation of Mormonism’s view of Jewish people. The Book of Mormon warned that “many plain and precious things” had been excised by gentile Christians after the scripture had “gone forth in purity from the Jews” (contrast this to the writings of Justin, Chrysostom, and Pratt), and Joseph Smith had qualified his trust in the Bible: “We believe the Bible to be the word of God as far as it is translated correctly.” But Mormon authors writing in the half century between 1830 and 1880 were insulated from the disclosures of historical-critical scholarship of the Bible.34 Their “literal” interpretation of canon did not equip the Saints’ leaders to analyze critically the process of collection, composition, and redaction of scripture. Nor were they attuned to complex rhetorical, ecclesiastical, and theological intentions of biblical authors and editors. For example, in spite of the traditional Christian reading of selected passages of the New Testament, there is no indication that it was Jesus’ or Paul’s intention to have their contextually specific criticism of fellow Jews translated by gentiles into a negation of Israel’s covenant, law, and election. But this is exactly what [p.186] occurred. Jesus’ critique of his fellow Jewish sectarian contemporaries and Paul’s running battle with critics of his gentile mission have been misunderstood by Christians as authoritative warrants for anti-Judaic theology and actions. Mormons were not immune to this interpretive mistake. Orson Pratt’s 1859 sermon illustrates this point. He could embrace without compunction the most skeptical conclusions of the “lower” or text/manuscript critics of biblical canon: “All, therefore, is uncertainty, not only in the Hebrew manuscripts, but also the Greek.”35 And yet it would scarcely occur to him or his colleagues to question the “literal” meaning of the text backed by a long-lived theological and exegetical tradition negating “old” Israel as a whole. The allegorical or spiritual method has been extremely influential and long lived in the Christian churches. This method, what early Mormons criticized as “spiritualizing,” has also been employed by clergy as a principal tool for anti-Jewish theology as the brief references from “Barnabas,” Justin, and Augustine suggest. Thus the Mormon attack on “spiritualizing” was entwined with its polemic against certain Christian views of Israel and with Mormonism’s “correction” of Christian understanding of “Old” Testament passages dealing with the restoration of Israel. The interpretation of these passages was a matter of intense debate, for their “resolution,” many believed, provided keys to reading the pattern imprinted on unfolding apocalyptic events. To whom did the term “Jew” refer? Which city did “Jerusalem” signify? What was actually meant by “restoration”? 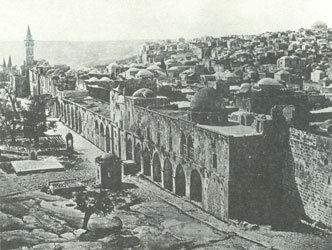 Deploying allegorical or spiritual principles of interpretation, Christians concluded frequently that Jerusalem was the “heavenly city” or the church of [p.188] Christ, that Israel pointed to the “New” Testament church or an apocalyptic one comprised of Jews converted en masse to a gentile church. To draw such conclusions, Mormons believed, meant concluding as well that the historical covenants and promises of God to a historical people—whether Jew or Mormon—were feckless and uncertain at best, malicious at worst. The Mormon confrontation with Millerite adventism in the early 1840s provided a prime example of this concern for a historical reading of Israel in the latter days. According to Miller’s exegesis, the “dispensation” of Israel’s ancient covenant had ended with the rise of the Church of Christ. If Israel had been effectively displaced by the Church of Christ, then all of Israel’s covenants, its promises, and all prophetic pronouncements concerning the end of its exile, its return, salvation, and restoration referred exclusively to Christians. Mormons were openly arrayed against such an approach to the scriptural record. Latter-day Saints contended with any who tried to usurp Israel’s concrete scriptural promises and covenants as if these interlopers were modern Marcionites.43 If Israel’s covenant and worship had come to naught and its home in this world was acquired by an upstart church, despite all the promises and prophecies recorded in scripture, then the Saints’ own community and worship and the “covenants” on which they were grounded would become similarly tenuous.44 Devotion to a literal/historically interpreted scripture instilled in the Saints a trust in the integrity of God’s promises and [p.190] a respect for the example of Israel, its institutions, laws, and narratives. The phrase “the times of the Gentiles” focused on a commonly held tenet within the Mormon faith. Invoking this passage from Luke 21:24 was part of the stock-in-trade of Mormon preaching and prophesying.46 “The meaning of this suggestive phrase is not clear,” wrote biblical scholar A. B. Bruce,47 and later commentators tend to agree that the passage is a subsequent “editorial elaboration.”48 However, Mormons understood that “times of the Gentiles” referred to a literal space of “time.”49 In this case Mormons believed the passage implied that a season had been accorded the gentiles, first to become “adopted seed of Abraham” or to enter the Church of Christ and second to exercise worldly, political supremacy over the nations, especially over the Jewish people. In the nineteenth century, abundant “signs” pointed to the imminent demise of the “fourth monarchy.” The “restoration of the fulness of the gospel,” the founding of the Latter-day Saint church, was one unmistakable sign. Natural convulsions, disasters, and the “wars and perplexities of the nations” all contributed to an accumulating weight of evidence pointing to the passing of the age. A public and unambiguous sign, according to many Saints, was the resurgence of Jewish aspiration for a return to Palestine and the restoration of a state. The return and restoration of the Jewish people would, Mormons confidently expected, confirm their reading of biblical prophecy,51 vouchsafe the words and promises of God, add luster to the credentials of the Saints and their prophets, and inaugurate the last messianic/millennial dispensation. The work of building the foundations for the kingdom reposed on the Saints and on Israel if they were ever “to possess an inheritance in Zion or Jerusalem.” Each community had its responsibilities and tasks. The labor and sacrifices of covenant communities would, [p.195] the Saints hoped, then be capped by the advent of the Lord Jesus Christ who would reign personally on the earth for a thousand years from the messianic capitals of Jerusalem and Zion. 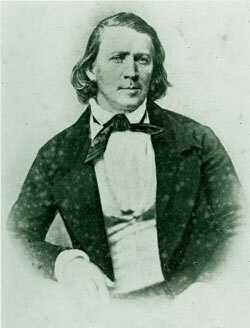 It was the task of the Saints, Brigham Young preached in May 1863, “to build up [the] Zion of our God, to gather the House of Israel, restore and bless the earth with our ability and make it as the Garden of Eden, store up treasures of knowledge and wisdom in our own understandings, purify our … hearts and prepare a people to meet the Lord when he comes.”64 Meanwhile “Jerusalem,” Young opined, “is not to be redeemed by our going there and preaching to the inhabitants.”65 “We have a great desire for their [the Jewish people’s] welfare,” Young affirmed on another occasion, “and are looking for the time soon to come when they will gather to Jerusalem, build up their city and the land of Palestine.…”66 Young, an avid disciple of Smith, varied from the tradition established by Joseph earlier in Nauvoo which construed Israel’s restoration as temple-centered and independent from the church. Those in Mormonism’s second tradition which began with Joseph Smith and Orson Hyde were largely self-taught and grew up with only the most tenuous ties to organized Christian bodies. They expressed positive and independent ideas about the relation between Zion and Jerusalem. Ignorant of or underwhelmed by theologies and practices directed at the Jews by the Christian tradition, these other Saints, unlike Pratt and Cowdery, felt no obligation to respond to and had no reason to imitate this tradition. They felt compelled by events, by the word of scriptures and of living Jews, to search in the metaphors and language they possessed for an affirmation of the existence and integrity of the Israel of God, as well as that of the Saints. On occasion he felt constrained to speculate on the nature of the great millennial age. “Many of our Elders,” Young remarked, “labor under … erroneous expectations when reading over the sayings of the Apostles and Prophets in regard to the coming of the Son of Man.” Young’s corrections to “these erroneous expectations” were voiced on three separate occasions: 8 July 1855, 23 December 1866, and 16 August 1868.74 In opposition to Pratt, Cowdery, and some of his own successors to the presidency of the church, Young foresaw a remarkably pluralistic future in the age to come. Many Saints harbored hopes that their cause and their hardships would be vindicated unequivocally in the millennial age. Foes would be vanquished, the church would be crowned with laurels, rival religious traditions would wither away or collapse under the weight of millennial events, and the earth would once again be a paradise to humankind. Here finally beyond the horizon of the “times of the Gentiles,” all the doctrines and opinions of the Saints would be verified. But Brigham Young in deference to his mentor and prophet, Joseph Smith, denied the Saints even this last sanctuary. And in his sermons he indicated to the Saints that the “truth” and integrity of their religion did not depend on their exclusive triumph in this age or in the age to come. Young learned from Joseph Smith that human free agency was an irreducible fact and birthright bestowed on all the children of God. Latter-day Saint theology and practice hinge to a significant degree on this agency and the related principle of accountability. Any social order be it mortal or celestial in which these principles were forfeited or suppressed was in principle repugnant to Young. He remembered the Saints’ bitter experience of persecution and Smith’s teachings on human agency and his vision of plural, temple-ordered societies. Thus Young felt compelled to oppose those within the church who projected a future, monolithic order dictated or enjoyed exclusively by the Saints. It is not the case that Young considered all religious traditions of equal value or above criticism. He lived and died a staunch advocate of the Latter-day Saint cause and never failed to level withering blasts, solemn and satirical, at the follies of other religions when he deemed it fitting to do so. Yet for all his lack of ecumenical spirit, Brigham Young’s ideas about the coexistence of plural [p.200] religious societies display a wisdom that only now Latter-day Saints are beginning to appreciate. Contemporary members of the LDS church come from around the world. As the church thus inevitably confronts other religious traditions and communities, Young’s opinions on the continued existence of a multitude of religions throughout the Millennium may yet enable the LDS church to reassess the integrity and staying power of the gentiles and the Jews. Interreligious dialogue and sympathetic yet critical inquiry into other religious traditions were sanctioned by Young’s unusual sermons on the Millennium and the “last things.” After telling the congregation that “Jews and gentiles” will not “be obliged to belong to the Church of Jesus Christ of Latter-day Saints,” Young went on to construe human, religious, and cosmic orders as eternally pluralistic. “Jesus said to his disciples, ‘in my father’s house are many mansions.’ … There are mansions in sufficient numbers,” Young then concluded, “to suit the different classes of mankind, and a variety will always exist to all eternity requiring a classification and an arrangement into societies and communities in the many mansions which are in the Lord’s house, and this will be for ever and ever “78 Young confessed that this may be “a strange doctrine to outsiders. But what do they know about the Bible, heaven, angels, or God?”79 Contrary to fervent expectations of many, Young taught the Saints that membership in the church was not the inexorable, universal goal of humankind. Mormon/Jewish encounter has been handicapped by the tradition of Cowdery, Pratt, and their ideological descendants. According to this tradition, the “seed” of the covenant with Judah will wither and lose its particular vintage when the millennial dawn erupts and will be grafted into the perennial, unfading growth of the Church of Christ. According to this reading, Jewish autonomy is provisional, Jewish religion and institutions [p.201] ephemeral, and the restoration and gathering of Israel merely an instrumental means to an ultimate end—the vindication and triumph of the Church of Christ, a millennial body identical with and inclusive of the Kingdom of God. All of the good will, respect, support, kinship, and deference manifested by the church to the Jewish people is vitiated by this provisional grant. Young’s eschatology is to be recommended in relations between Jews and Mormons and is crucial for the development of Mormon thought. When Joseph Smith encountered Joshua Seixas, when Orson Hyde walked through the streets of Jerusalem the night before his “dedicatory prayer,” and when Young encountered and analyzed the persisting distinctions between Jew and Mormon, Mormon and gentile, Mormon “theoretical” religion came face to face with an inherited, bewilderingly plural world. In the eyes of Joseph Smith and Brigham Young the promises and responsibilities of the covenant bestowed on Israel, as recorded in scripture and reiterated in the formative doctrine of the LDS church, argued forcefully [p.202] for the independence, integrity, and continuity of the particular witness and reality of the Jewish people. After 1830, Latter-day Saints professed that another covenant community had been convoked from the nations to help lay the foundations of the coming messianic, millennial age. Thoughtful Mormons did not presume to denigrate or claim exclusive rights to Israel’s covenant. Neither displacement of nor identity with the Jewish people characterize Mormon thought. Historically and emotionally, however, Mormon thought and practice have been grounded in the vision of two communities of covenant, who strive to approach a common value which limits, defines, and draws them both. That value is the Kingdom of God on earth. The dream of it, the pilgrimage toward and the work and sacrifice for it, may yet bring us into the house of our father, with its eternally pluralistic “arrangement into societies and communities” in the age to come. 1.Bertram Korn in his introduction to S. N. Carvalho, Incidents of Travel and Adventure in the Far West (1854; reprt., Philadelphia: Jewish Publication Society, 1954), 136. 4. Ibid., 141, 142, 148. 5. Ibid., 143. As an admirer of Isaac Leeser, Carvalho would have been especially interested in this experiment in colonization of an arid region. Leeser’s own views on Jewish settlement in Palestine were becoming increasingly “secular” and practical. See Maxine S. Seller, “Isaac Leeser’s Views on the Restoration of a Jewish Palestine,” American Jewish Historical Quarterly, 63 (Sept. 1968): 118-35. Leeser was the editor of The Occident and minister/hazzan of Mikveh Israel in Philadelphia. 6. Carvalho, Incidents of Travel, 142. 8. Journal History, 28 July 1844, archives, Historical Department, Church of Jesus Christ of Latter-day Saints, Salt Lake City, Utah; hereafter cited as Journal History. 9. Ibid., 5-6 Apr. 1845. 10. Times and Seasons, 3 (15 Aug. 1842): 890. 11. Ibid., 3 (15 Oct. 1842): 952. The author of this assessment was probably the new editor, John Taylor. 12. Journal History, 8 Apr. 1853, 9. 13. Ibid., 14 Mar. 1869. 14. For a summary sketch of Wilford Woodruff, see Richard Van Wagoner and Steven Walker, A Book of Mormons (Salt Lake City: Signature Books, 1982), 395-401. 15. Examples of Woodruff’s writings and sermons on the subject can be found in the following entries of the multi-volume Journal of Discourses, first published in Liverpool between 1 Nov. 1853 and 17 May 1886: 8:262,263; 1:245; 13:161; 18:220-21, 225; 21:300-301, 343; 23:128 (hereafter JD); and in the Journal History entries for 27 Feb. 1857 and 50 June 1878. 20. For a detailed bibliography, see Chad J. Flake, ed., A Mormon Bibliography: 1830-1930 (Salt Lake City: University of Utah Press, 1978), 512-20; and Breck England, The Life and Thought of Orson Pratt (Salt Lake City: University of Utah, 1985), 339-41. 21. England, Life of Orson Pratt, 100. 25. For the entire address, see JD 14:58-70. 26. Times and Seasons, 2 (1 July 1841): 454. 27. Journal History, 18 Aug. 1844. 28. Ibid., I Nov. 1845. 29. Orson Spencer, Letters Exhibiting the Most Prominent Doctrines of the Church of Jesus Christ of Latter-day Saints … (1848; reprt., Salt Lake City: George Q. Cannon and Sons, Co., 1891), 104, 7, 105, 112. Spencer was a graduate of Union College and the Baptist Theological Seminary. He was a “professor of languages” for the University of the City of Nauvoo and first chancellor of the University of Deseret founded in 1850 in Salt Lake City. Spencer died in 1855. 31. Parley P. Pratt, A Voice of Warning and Instruction to All People …, (Salt Lake City: Deseret News Press, 1952) was described by Peter Crawley and Chad J. Flake as “the most important of all noncanonical Mormon books … it was the first to emphasize the difference between Mormonism and traditional Christianity. More important, it erected a standard for all future Mormon pamphleteers.… Before the close of the century, Voice of Warning went through more than thirty editions in English and was translated into Danish, Dutch, French, German, Spanish, and Swedish.” Item number 7 in Peter Crawley and Chad Flake, A Mormon Fifty: An Exhibition in the Harold B. Lee Library in Conjunction with the Annual Conference of the Mormon History Association (Provo, UT: Friends of the Brigham Young University Library, 1984). 32. Pratt, A Voice of Warning, 89, 197. 34. They were also on the far side of theological disputations raised because of discoveries in the natural sciences. For a discussion of the impact of Darwin on theology, see Ian G. Barbour, Issues in Sciences and Religion (New York: Harper & Row, 1971), 80-114. 36. For example, James Barr has pointed out both the ambiguity and misuse of this term by contemporary scholars of “fundamentalist” and “liberal” perspectives when promoting their presuppositions, methodologies, and conclusions—or attacking those of rivals. See James Barr, Fundamentalism (Philadelphia: Westminster Press, 1978), 40-89, 120-59. 37. Quoted in Robert Grant, The Bible in the Church: A Short History of lnterpretation (New York: Macmillan Co., 1948), 105. 38. J. N. D. Kelly, Early Christian Doctrines, rev. ed. (San Francisco: Harper & Row, 1978), 8. 40. Eldon J. Watson, ed., Manuscript History of Brigham Young: 1841-1844 (Salt Lake City: Eldon Watson, 1968), 142-43. 41. William Appleby, A Few Important questions for reverend Clergy to answer … (Philadelphia: Brown, Bicking & Guilbert, 1843), 8. 42. Moses Martin, A Treatise on the fulness of the everlasting Gospel … (New York: J. W. Harrison, 1842), 7, 54. 43. Marcion, who died around 160 C.E., was an extremely influential early Christian “heretic.” His work, Antitheses, proposed that the God of the Hebrew scriptures was a malign demiurge dedicated to law rather than love. Thus the God of Christianity and of the apostolic writings and the God of the Hebrew scriptures were not one and the same. Jesus came to reveal the “Supreme God of Love.… It was his purpose to overthrow the Demiurge.” See The Oxford Dictionary of the Christian Church, ed. F. L. Cross, 2d ed. (London: Oxford University Press, 1974), 870-71. In a modem context “marcionite” would mean interpretations of Christianity and scripture, which “undervalue or … misunderstand the place of the Old Testament in the eluncidation of the Christian revelation.” See Alan Richardson, “Marcionism,” The Westminster Dictionary of Christian Theology, eds. Alan Richardson and John Bowden (Philadelphia: Westminster Press, 1983), 344-45. 44. Brigham Young in a sermon recorded in JD 12:242-43 noted that the delivery of Israel was a result of the faithfulness of God to his promises to the patriarchs and not the on-going state of Israel’s righteousness and faith. 45. Journal History, 5 Jan. 1882. 47. The Expositor’s Greek Testament, ed. W. Robertson Nicoll, vol. 1 (Grant Rapids, MI: Wm. B. Eerdmans Publishing Co., 1983), 621. 48. S. Maclean Gilmore, “The Gospel According to St. Luke,” in The Interpreter’s Bible … in Twelve Volumes, vol. 8 (New York: Abingdon-Cokesville Press, 1952), 368. 49. Jeremiah Untermann and Paul J. Achtemeier, “Time,” in Harper’s Bible Dictionary, ed. Paul J. Achtemeier (San Francisco: Harper & Row, 1985), 1073. 51. See JD 13:161; 21:300-301. 52. The pursuit by Mormon readers of a “literal” reading of scripture did violence to the poetic devices of prophetic authors. The apposite titles of Zion and Jerusalem, twinned frequently together in Hebrew scriptures, pointed to a single territorial referent. Mormon exegetes split the single referent in two and contrived reference to more than one place. Zion and Jerusalem were two distinct capitals of the coming millennial age. 53. JD 3:134, 136, 137. 61. Times and Seasons, 2 (2 Aug. 1841): 488-91; 2 (16 Aug. 1841): 504-507. 67. Journal History, 13 Aug. 1880. 68. Ibid., 10 Sept. 1879. 69. An excellent representative, non-LDS source is Charles Hodge, Sytematic Theologly vol. 3 (New York: Charles Scribner’s Sons, 1872), especially “Part IV, Eschatology, chapter III, Second Advent,” 791-92,807-812. 70. See England, Life of Orson Pratt, 97, 141-42, 192, 202-11, 227-29, 264-66. 73. See the “Index” to Discourses of Brigham Young …, comp. John A. Widstoe (Salt Lake City: Deseret Book, 1951). 74. JD 2:316-17, 11:275, 12:274.